The Prophet ﷺ and his companions entered Makkah on Sunday the 4th of Dhul Hijjah before carrying out the rites of Umrah. 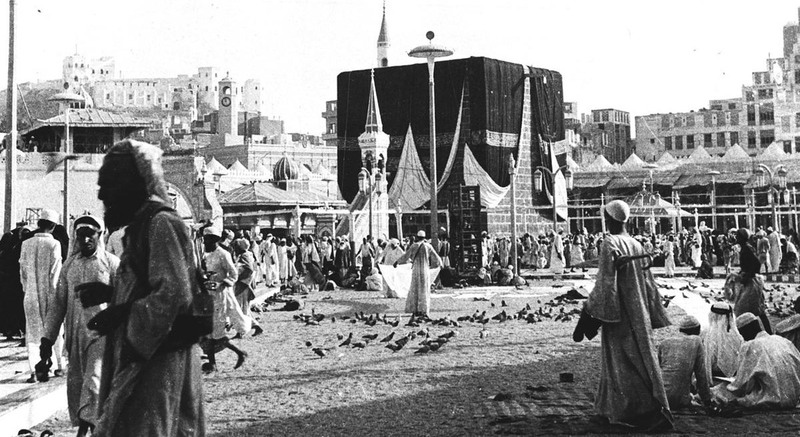 After its completion, they moved to al-Abtah, situated to the east of Makkah, where they remained until the start of Hajj. Before entering the city, he encamped at Dhu Tuwa, known as Jarwal or Abar al-Zahir today, where he spent the night. On the morning of the 4th of Dhul Hijjah, the Prophet ﷺ performed Fajr Salah near a large knoll close to the mosque that had been built there, rather than within the mosque itself. He then bathed himself using the water from the Well of Tuwa, as was his usual practice before entering Makkah.1Al-Bukhari, Hadith No. 1553, 1573, 1574 & 1769; Muslim, Hadith No. 1257, 1258 & 1259; Abu Dawud, Hadith No. 1865; al-Nasa’i, Hadith No. 2862; Malik, Hadith No. 713. The Prophet ﷺ proceeded in the direction of the mountain that stood between him and the Kaaba, Jabal Adhakhir, and entered Makkah in mid-morning from its high point at Kada via the highest pathway.2Al-Bukhari, Hadith No. 1767; Muslim, Hadith No. 1257 & 1258; Malik, Hadith No. 713. He descended the valley riding on his she-camel, al-Qaswa, whilst repeating the Talbiyah. As he came to the residential area, he was received by some boys belonging to the Abdul Mutallib clan who welcomed him and expressed their joy. He mounted one of them in front of him and the other behind him as he made his way to Masjid al-Haram.3Al-Bukhari, Hadith No. 1798. 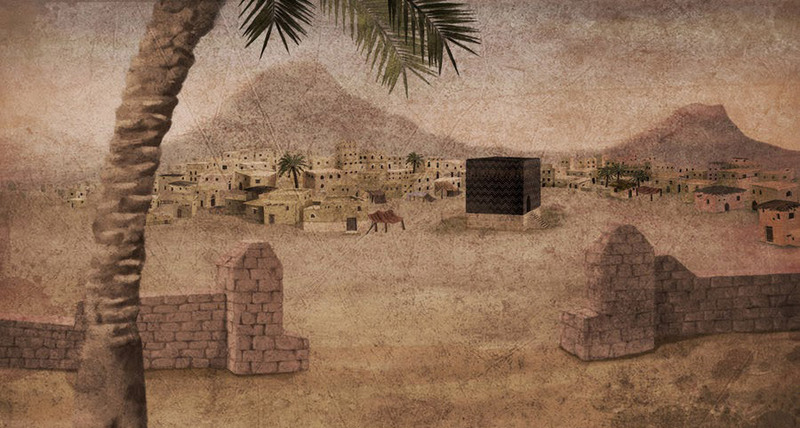 During this period, the mosque was a small open area with the Kaaba at its centre. 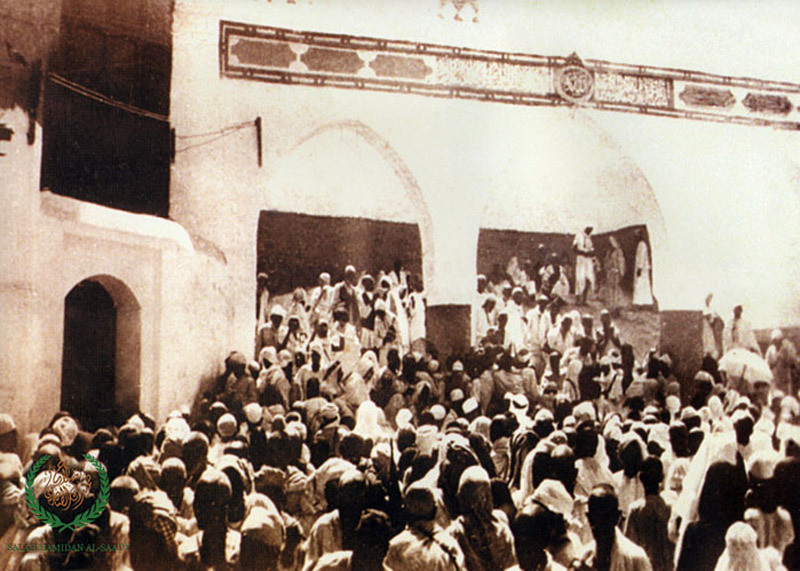 He entered through the gate known as Bab Abdi Manaf, now known as Bab Bani Shaybah or Bab al-Salam, situated between Safa and Marwah on the same side as the Prophet’s birthplace. This was the gate that the Prophet ﷺ would normally use to enter the mosque when he lived in Makkah. It was a practice of the Prophet ﷺ to perform two Rakats Nafl upon entering a mosque (Tahiyyat al-Masjid). However, when he entered Masjid al-Haram on this occasion, he headed straight to the Kaaba without offering the prayer. Allāhumma zid hādha l-bayta tashrīfan wa takrīman wa ta’ẓīman wa mahāba(tan), wa zid man sharrafahu wa karramahu mimman ḥajjahu wa’tamarahu tashrīfan wa ta’ẓīman wa birrā. O Allah, increase this House in honour and ennoblement, reverence and awe, and increase the one who honours and ennobles it, of those who travel to it to for Hajj and Umrah, in honour, reverence and piety. Allāhumma anta s-salāmu wa minka s-salāmu fa hayyinā Rabbanā bi s-salām. The Prophet ﷺ put his blessed lips upon the stone and cried for a long time. When he raised his head, he saw Umar crying too and said: ‘Umar, this is the place to cry. '8Al-Salihi, Subul al-Huda wa al-Rashad. By Allah! I know that you are a stone and can neither benefit nor harm. Had I not seen the Prophet ﷺ touching and kissing you, I would never have touched and kissed you.9Al-Bukhari, Hadith No. 1602; al-Tirmidhi, Hadith No. 860; al-Nasa’i, Hadith No. 2937. The Prophet ﷺ then performed Tawaf, circumambulating the Kaaba seven times. He was wearing a green Yamani mantle which he had draped under his right armpit and over his left shoulder, exposing his right shoulder and right arm (Idtiba).10Abu Dawud, Hadith No. 1883. When the Prophet ﷺ was performing Tawaf of the Kaaba, he passed by a person who had tied his hands to another person with a rope or string or something of that nature. The Prophet ﷺ cut it with his own hands and said: ‘Lead him by the hand. '11Al-Bukhari, Hadith No. 1620, 1621 & 6703; Ahmad, Hadith No. 6714; al-Nasa’i, Hadith No. 2921 & 3810. The Prophet ﷺ continued to purge each ritual of practices that had been invented and introduced into the pilgrimage during Jahiliyyah, returning each rite to its original form. When Allah’s Messenger ﷺ and his companions came to Makkah, the pagans circulated the news that a group of people were coming to them and they had been weakened by the Fever of Yathrib (Madinah). So the Prophet ordered his companions to do Raml in the first three rounds of Tawaf and to walk between the two corners (Hajar al-Aswad and Rukn al-Yamani). The Prophet ﷺ did not order them to do Raml in all the rounds of Tawaf out of pity for them.13Al-Bukhari, Hadith No. 1602. There is no reason for us to perform Raml except that we wanted to show off before the pagans and now Allah has destroyed them. Nevertheless, the Prophet performed it and we do not want to abandon this Sunnah.14Al-Bukhari, Hadith No. 1605. 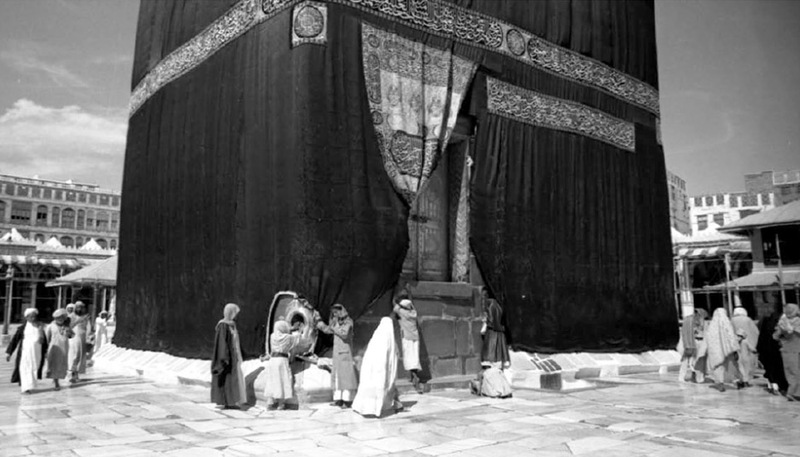 The Apostle of Allah ﷺ did not neglect touching Rukn al-Yamani and Hajar al-Aswad in each of his circumambulations.15Abu Dawud, Hadith No. 1876. When the Prophet ﷺ touched the Rukn he would recite ‘Bismillahi Wallahu Akbar’ and when he came to the Hajar he would proclaim ‘Allahu Akbar. '16Al-Muwahib al-Ladunniyyah. I saw Ibn Umar touching the Stone with his hand and then kissing his hand. He said: ‘I have never abandoned it since I saw Allah’s Messenger ﷺ doing it.17Muslim, Hadith No. 1268. Umar, you are a strong man. Don’t jostle at the stone, perhaps harming someone who is weak. If you should find the way to it clear, then salute it. Otherwise, face it and say Allahu Akbar.18Ahmad; al-Shafi. Allah’s Messenger ﷺ performed the Tawaf around the Kaaba while riding his camel and every time he reached the corner (of the Black Stone), he pointed at it with something in his hand and would say, ‘Allahu Akbar. '19Al-Bukhari, Hadith No. 1632. He didn’t touch nor handle the two remaining corners of the Kaaba. Rabbanā ātināfid-dunyā ḥasanatan wa fi l-ākhirati ḥasanatan wa qinā ‘adhāba n-nār. O our Lord, give us good in this world and good in the next world and guard us against the torment of the Fire.20Abu Dawud, Hadith No. 1892. Allāhumma innī as’aluka r-raḥata ‘inda l-mawti wa l-’afwa ‘inda l-ḥisābi. O Allah, I ask You for comfort at the time of death and forgiveness at the time of reckoning. Wattakhidhu Mim Maqami Ibrahima Musalla. And take the Maqam Ibrahim as a place of Salah.22Abd al-Razzaq, Al-Musannaf, vol. 5, pp. 47-49; Ibn Sa’d, Al-Tabaqat, vol. 2, p. 136 & vol. 3, p. 283; Al-Azraqi, Akhbar Makkah, vol. 2, p. 30. Standing between Maqam Ibrahim and the Kaaba, the Prophet ﷺ carried out a Salah consisting of two Rakats, reciting Surah al-Kafirun (Surah 109) in the first Rakat and Surah al-Ikhlas (Surah 112) in the second Rakat.23Al-Bukhari, Hadith No. 1691; Muslim, Hadith No. 1218 & 1227; al-Tirmidhi, Hadith No. 856; al-Nasa’i, Hadith No. 2939 & 2962; Ahmad, Hadith No. 6247. 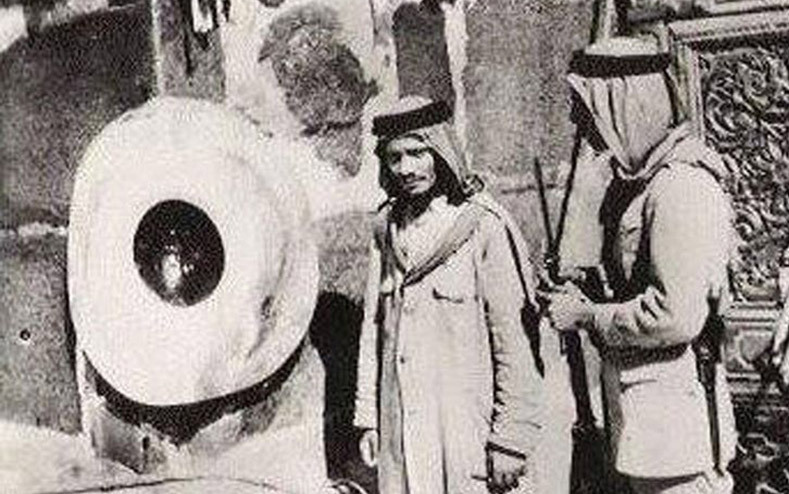 He then returned to the Hajar al-Aswad and kissed it, before wiping it with his hands and passing them over his face.24Muslim, Hadith No. 1218 & 1268; Ahmad, Hadith No. 15243; Ibn Khuzaymah, Hadith No. 2713. Indeed, Safa and Marwah are among the symbols of Allah. So whoever makes Hajj to the House or performs Umrah – there is no blame upon him for walking between them. And whoever volunteers good – then indeed, Allah is appreciative and Knowing. Alhamdu lillah, wala ilaha illallah, wallahu Akbar. All praise is due to Allah, there is no God but Allah, and Allah is the Greatest. Laa ilaha illallahu wahdahu la shareeka lahu, lahulmulku wa lahidhamdu, yuhyee wa yumeetu wa Huwa ala kulli shay’in Qadeer. There is none worthy of worship but Allah alone, no partners are unto Him, His is the dominion and His is the praise. He gives life and He gives death and He is capable of everything. La ilaha illallahu wahdahu, sadaqa wa’dahu, wa nasara abdahu, wa hazamal-ahzaaba wahdahu. There is none worthy of worship but Allah alone, who fulfilled His promise, and gave victory to His servant and defeated the confederates alone.25Muslim, Hadith No. 1218 & 1780; Ahmad, Hadith No. 10948, Abu Dawud, Hadith No. 1905; al-Nasa’i, Hadith No. 2961. He recited this three times and made his own supplications with his hands raised in between, before descending Safa and proceeding towards the hillock of Marwah. I saw the Prophet ﷺ performing Sa’i between Safa and Marwah and because of the severity of the Sa’i, his blessed Izar was flapping. He was saying to the companions ‘Perform Sa’i between Safa and Marwah for Allah has made it compulsory upon you.'26Ahmad. The Prophet ﷺ descended from Safa and proceeded towards Marwah. When he reached the low point (between the two hills) he walked fast and when he reached the higher places he walked (at normal pace). 27Ibn Majah, Hadith No. 2987; al-Nasa’i, Hadith No. 2961 & 2980; Ahmad, Hadith No. 27280, 27367 & 27368. When Allah’s Messenger ﷺ had come to Makkah, there was such a large gathering of people around him that even the young women had come out of their houses to catch a glimpse of his face. They were chanting: ‘He is Muhammad, he is Muhammad.’ Allah’s Messenger ﷺ was so gentle and kind that the people were not shoved back to make way in front of him. When there was a throng of people around him, he rode the she-camel.28Muslim, Hadith No. 1264; Abu Dawud, Hadith No. 1885. Upon reaching Marwah, he did the same as he had earlier done at Safa. He performed a total of seven laps between Safa and Marwah. 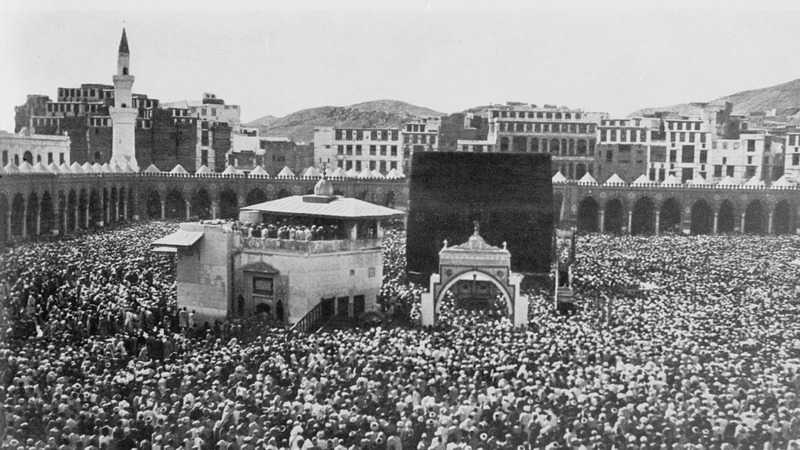 After having completed his Sa’i, he ordered everyone who had not brought a sacrificial animal to release themselves from Ihram completely, whether they had intended to combine Hajj and Umrah (Hajj al-Qiran), or to perform Hajj separately (Hajj al-Ifrad), and to remain in this state until Yawm al-Tarwiya (8th of Dhul Hijjah), at which point they would assume Ihram for Hajj. He said: “Those among you who have brought the Hady should not relinquish your Ihram until completing the Hajj. Those of you who have not brought the Hady should perform the Tawaf of the Kaaba and the Sa’i between Safa and Marwa, then cut your hair short and relinquish your Ihram, prior to assuming Ihram for Hajj later. But a Hady must be offered. Whoever cannot afford a Hady should fast for three days during the Hajj and seven days upon returning home.”29Al-Bukhari, Hadith No. 1568 & 1691; Muslim, Hadith No. 1216 & 1227; Ahmad, Hadith No. 6247. Those of his companions who had brought their sacrificial animals with them, such as Abu Bakr, Umar, Uthman, Talhah, al-Zubayr and Abd al-Rahman ibn Awf M remained in the state of Ihram. The wives of the Prophet ﷺ, who had not brought sacrificial animals with them, left the state of Ihram although they had intended to combine Hajj and Umrah i.e. perform Hajj al-Qiran. The only notable exception was Aisha J, who remained in Ihram as a result of being in a state of menstruation. One of the wives of the Prophet ﷺ, Hafsa bint Umar J, asked the Prophet ﷺ: “Why haven’t you released yourself from Ihram after having performed Umrah?” He answered: “I have matted my hair and marked my sacrificial animal, and as such, I won’t release myself from Ihram until I have carried out the Hady.”30Al-Bukhari, Hadith No. 1566 & 4398; Muslim, Hadith No. 1229. Our hearts were anguished on account of this and the reaction of the people reached the Messenger of Allah. We do not know whether he received this news from the Heavens (through revelation) or from the people.31Al-Bukhari, Hadith No. 1568; Muslim, Hadith No. 1216. 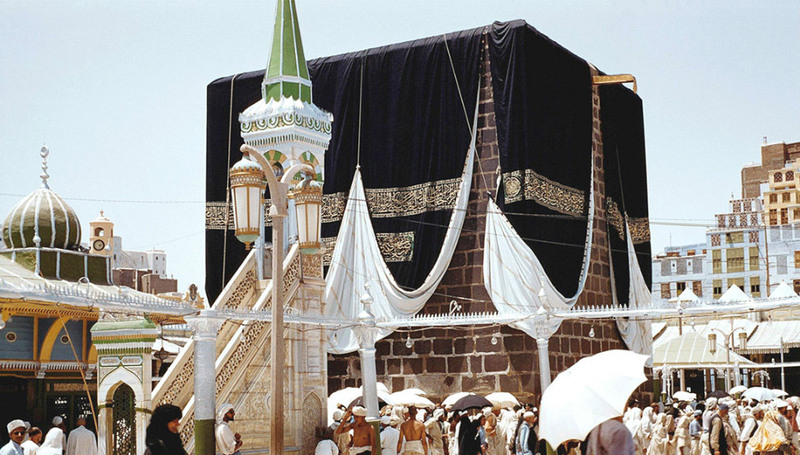 Another reason for their hesitancy was they would be performing Umrah during the months of Hajj, an act which was inconceivable for some of the companions at the time, as this was something that was prohibited before the advent of Islam.32Al-Bukhari, Hadith No. 1564; Muslim, Hadith No. 1240; Ahmad, Hadith No. 2274. They were also perplexed by the fact that they were able to enjoy everything available to a person who was not in Ihram when the Day of Arafat, considered to be the climax of the pilgrimage, was only a few days away.33Al-Bukhari, Hadith No. 7367 Furthermore, they saw the Prophet ﷺ himself had remained in a state of Ihram and such was their desire to emulate everything that he did out of their love for him, they were slow to comply with his command. You are well aware that I am the most God-fearing, most truthful and most pious amongst you. If there weren’t sacrificial animals with me, I would also have left the state of Ihram as you have. And if I knew what I have come to know now, I wouldn’t have brought sacrificial animals with me.”34Al-Bukhari, Hadith No. 1568, 1651 & 7367; Muslim, Hadith No. 1216 & 1218; Ahmad, Hadith No. 15244 & 18523. Satisfied with what the Prophet ﷺ had said, the companions cut their hair and released themselves from the state of Ihram. One of the companions, Suraqah ibn Malik ibn Ju’shum I, asked the Prophet ﷺ: “Messenger of God, is this Tamattu that we have carried out only for this year or forever?” The Prophet ﷺ interlaced his fingers and said: “No. It is for all time (he repeated this three times). The Umrah will be associated with the Hajj until the Day of Judgement (like this).”35Muslim, Hadith No. 1218; Ibn Majah, Hadith No. 3074; Ahmad, Hadith No. 14440. Thus, the Prophet ﷺ sanctioned the performance of Umrah during the months of Hajj for all time, a practice that had previously been prohibited during the period of Jahiliyyah. 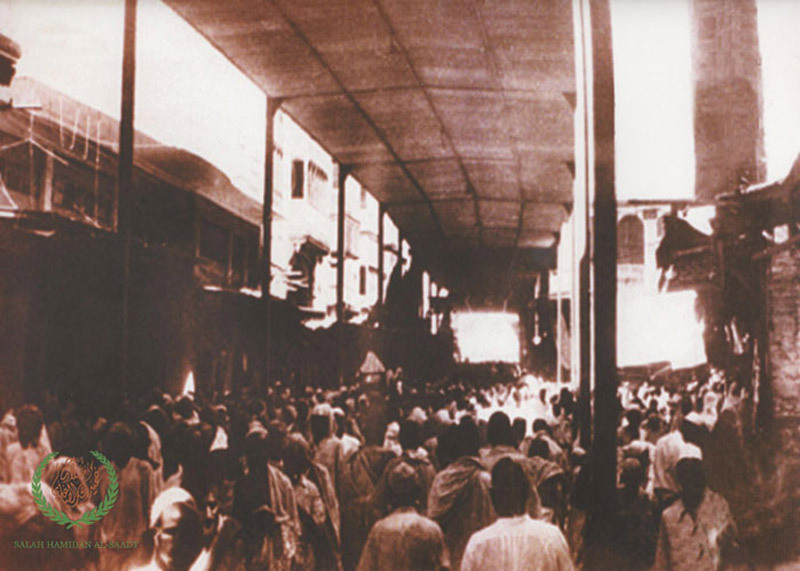 After having completed the initial rites of the pilgrimage, the Prophet ﷺ and his companions moved to al-Abtah, also known as Wadi al-Muhassab or Khayf Bani Kinanah, situated to the east of Makkah. 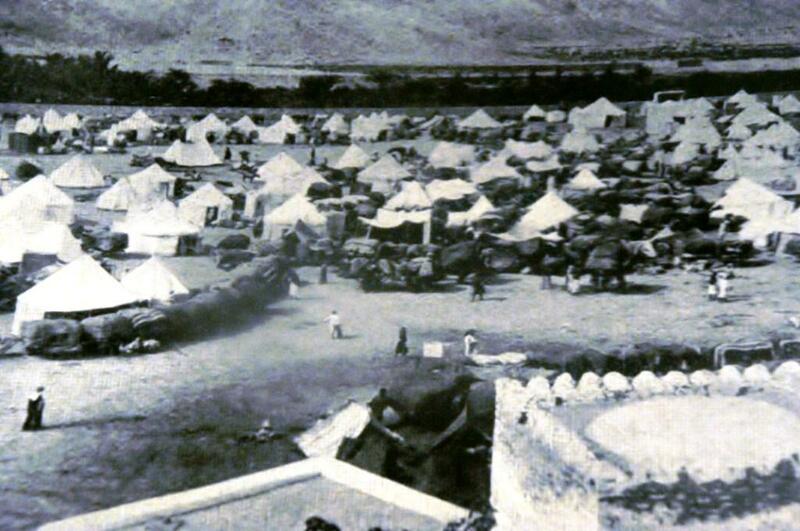 Al-Abtah was the ideal place for an encampment as it was open, comfortable and the supply of water, provided by wells in the area, was plentiful. He remained in al-Abtah from the time of Dhuhr on Sunday to Fajr on Thursday, a total of four days. He observed 20 prayers there, shortening all of them. I went to the Prophet ﷺ at al-Abtah while he was in a red tent. Bilal I came out with the remainder of his ablution water sprinkling it on those around him. Bilal made the call to prayer and I watched as his mouth moved first here, then there (to the right and the left). Then a short lance was set up and the Messenger of God came out, dressed in a red jubba, or a red hulla, and I thought I could see the shine of his legs. He performed the Dhuhr or the Asr prayer facing towards the lance. Women, dogs and donkeys passed by without hindrance. 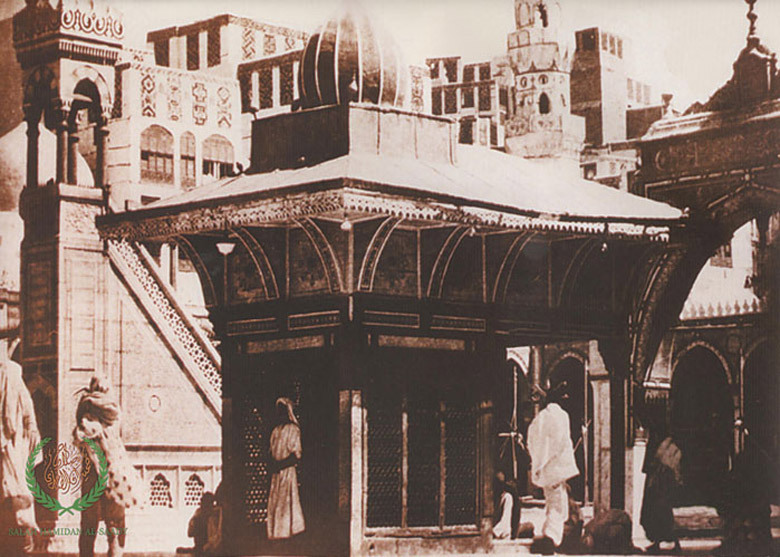 He kept on performing prayers of two Rakats until he reached Madinah. Then people began taking hold of his hand and wiping it over their faces. I took his hand and placed it on my face; I found it to be cooler than ice and more sweet-smelling than musk. 36Al-Bukhari, Hadith No. 376, 3553, 3566 & 5786; Muslim, Hadith No. 503. 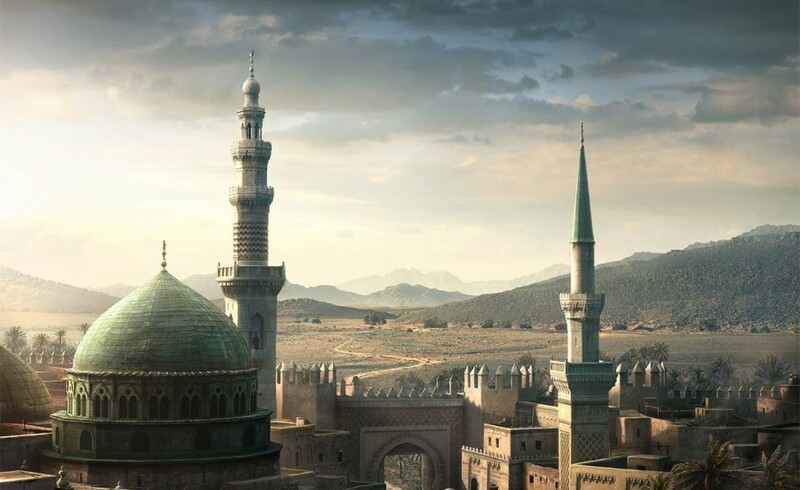 Ali ibn Abi Talib returned from Yemen when he was a governor. The Prophet ﷺ said to him: ‘With what intention have you assumed the state of Ihram?’ Ali answered: “I have assumed Ihram with an intention as that of the Prophet ﷺ.’ The Prophet ﷺ said to him: ‘Offer a Hady and remain in the state of Ihram as you are now. '37Al-Bukhari, Hadith No. 1558, 4352, 4353 & 4354; Muslim, Hadith No. 1216, 1218 & 1250. Ali came from Yemen with the sacrificial animals for the Prophet and found Fatima to be among those who had left Ihram, having put on dyed garments and kohl. Ali showed disapproval to it, to which she said: ‘My father has commanded me to do so.’ Ali narrated: ‘I went to the Messenger of Allah ﷺ showing annoyance at Fatima for what she had done and asked the verdict of Allah’s Messenger ﷺ regarding what she had narrated from him. I told him that I was angry with her. He said: ‘She has told the truth, she has told the truth. '38Muslim, Hadith No. 1218; al-Nasa’i, Hadith No. 2712; Abu Dawud, Hadith No. 1905. The Prophet ﷺ sent me to some people in Yemen and when I returned, I found him at al-Abtah. He asked me: ‘With what intention have you assumed Ihram (i.e. for Hajj or for Umrah or for both?”) I replied: ‘I have assumed Ihram with an intention like that of the Prophet.’ He asked: ‘Have you a Hady with you?’ I replied in the negative. He ordered me to perform Tawaf around the Kaaba and Sa’i between Safa and Marwa before leaving the state of Ihram.39Al-Bukhari, Hadith No. 1559; Muslim, Hadith No. 1221; Ahmad, Hadith No. 19505. Although his original intention was to perform Hajj al-Qiran, as he hadn’t brought a Hady along with him, the Prophet ﷺ instructed him to perform Hajj al-Tamattu instead. The 7th of Dhul Hijjah was known as Yawm al-Zeenah (Day of Decoration) on account of the sacrificial animals that were garlanded and garnished that day. After Dhuhr Salah, the Prophet ﷺ addressed his companions, instructing them about the rituals they were to carry out.40Al-Fakihi, Akhbar Makkah, 1901; Ibn Khuzaymah, Sahih, Hadith No. 2793; al- Hakini, Al-Mustadrak, vol. 1, p. 461; al-Bayhaqi, Sunan, vol. 5, p. 111. There is a difference of opinion over whether the Prophet ﷺ visited the Kaaba during this waiting period. Some scholars maintain that he didn’t, whilst others indicate the aforementioned sermon was made in Masjid al-Haram and that he performed Tawaf before living for Mina. The Prophet ﷺ arrived in Makkah and performed Tawaf of the Kaaba, before performing Sa’i between Safa and Marwa. However, he did not approach the Kaaba after his Tawaf until he returned from Arafat.41Al-Bukhari, Hadith No. 1625. 1. ↑ Al-Bukhari, Hadith No. 1553, 1573, 1574 & 1769; Muslim, Hadith No. 1257, 1258 & 1259; Abu Dawud, Hadith No. 1865; al-Nasa’i, Hadith No. 2862; Malik, Hadith No. 713. 2. ↑ Al-Bukhari, Hadith No. 1767; Muslim, Hadith No. 1257 & 1258; Malik, Hadith No. 713. 3. ↑ Al-Bukhari, Hadith No. 1798. 6. ↑ Al-Bukhari, Hadith No. 1597; Muslim, Hadith No. 1270; al-Tayalisi, al-Musnad, Hadith No. 28; al-Shafi’i, al-Musnad, Hadith No. 591. 8. ↑ Al-Salihi, Subul al-Huda wa al-Rashad. 9. ↑ Al-Bukhari, Hadith No. 1602; al-Tirmidhi, Hadith No. 860; al-Nasa’i, Hadith No. 2937. 10. ↑ Abu Dawud, Hadith No. 1883. 11. ↑ Al-Bukhari, Hadith No. 1620, 1621 & 6703; Ahmad, Hadith No. 6714; al-Nasa’i, Hadith No. 2921 & 3810. 12. ↑ Al-Bukhari, Hadith No. 1644; Muslim, Hadith No. 1218 & 1261. 13. ↑ Al-Bukhari, Hadith No. 1602. 14. ↑ Al-Bukhari, Hadith No. 1605. 15. ↑ Abu Dawud, Hadith No. 1876. 17. ↑ Muslim, Hadith No. 1268. 19. ↑ Al-Bukhari, Hadith No. 1632. 20. ↑ Abu Dawud, Hadith No. 1892. 22. ↑ Abd al-Razzaq, Al-Musannaf, vol. 5, pp. 47-49; Ibn Sa’d, Al-Tabaqat, vol. 2, p. 136 & vol. 3, p. 283; Al-Azraqi, Akhbar Makkah, vol. 2, p. 30. 23. ↑ Al-Bukhari, Hadith No. 1691; Muslim, Hadith No. 1218 & 1227; al-Tirmidhi, Hadith No. 856; al-Nasa’i, Hadith No. 2939 & 2962; Ahmad, Hadith No. 6247. 24. ↑ Muslim, Hadith No. 1218 & 1268; Ahmad, Hadith No. 15243; Ibn Khuzaymah, Hadith No. 2713. 25. ↑ Muslim, Hadith No. 1218 & 1780; Ahmad, Hadith No. 10948, Abu Dawud, Hadith No. 1905; al-Nasa’i, Hadith No. 2961. 27. ↑ Ibn Majah, Hadith No. 2987; al-Nasa’i, Hadith No. 2961 & 2980; Ahmad, Hadith No. 27280, 27367 & 27368. 28. ↑ Muslim, Hadith No. 1264; Abu Dawud, Hadith No. 1885. 29. ↑ Al-Bukhari, Hadith No. 1568 & 1691; Muslim, Hadith No. 1216 & 1227; Ahmad, Hadith No. 6247. 30. ↑ Al-Bukhari, Hadith No. 1566 & 4398; Muslim, Hadith No. 1229. 31. ↑ Al-Bukhari, Hadith No. 1568; Muslim, Hadith No. 1216. 32. ↑ Al-Bukhari, Hadith No. 1564; Muslim, Hadith No. 1240; Ahmad, Hadith No. 2274. 34. ↑ Al-Bukhari, Hadith No. 1568, 1651 & 7367; Muslim, Hadith No. 1216 & 1218; Ahmad, Hadith No. 15244 & 18523. 35. ↑ Muslim, Hadith No. 1218; Ibn Majah, Hadith No. 3074; Ahmad, Hadith No. 14440. 36. ↑ Al-Bukhari, Hadith No. 376, 3553, 3566 & 5786; Muslim, Hadith No. 503. 37. ↑ Al-Bukhari, Hadith No. 1558, 4352, 4353 & 4354; Muslim, Hadith No. 1216, 1218 & 1250. 38. ↑ Muslim, Hadith No. 1218; al-Nasa’i, Hadith No. 2712; Abu Dawud, Hadith No. 1905. 39. ↑ Al-Bukhari, Hadith No. 1559; Muslim, Hadith No. 1221; Ahmad, Hadith No. 19505. 40. ↑ Al-Fakihi, Akhbar Makkah, 1901; Ibn Khuzaymah, Sahih, Hadith No. 2793; al- Hakini, Al-Mustadrak, vol. 1, p. 461; al-Bayhaqi, Sunan, vol. 5, p. 111. 41. ↑ Al-Bukhari, Hadith No. 1625.